Digital Antique are just about to release their second album. This band are the best of both worlds in that they are a four piece rock band and have a string quartet tagged on as well, or is it a string quartet with a four piece rock band tagged on. Whatever way it is, they make an awesome sound. The previous release was simply called Digital Antique while this release is called Digital Antique II. Believe me, all the effort was put into the music. 10 tracks that put simply are all really good in their own way. It comes in at just over 38 minutes in length, with the opener at 1:41 and the longest song at 5:51. So what does it sound like, well the first track ‘Doomed Hero’ starts off with a conversation talking about computer age kids and how they have a thousand friends online but none in real life. But the music starts off really rocking then the strings come in and take over. This is a clever song, I actually thought it was a mellotron in the song when I heard it at first then I realized it was actually the string quartet who were playing. All the songs have a really nice mixture of sounds, with the strings prominent one minute then the rock side of it takes over. I particularly like the interplay between the strings and guitar. The songs are lush in melodies and with a grand sound that is progressive, post-rock, cinematic and at times maybe post classical thrown in for good measure. It is hard to pick a favourite song from this release but if I was forced to choose then I would pick ‘5 Marines’…no, maybe ‘Jonsii’, oh whatever. Check out the album and you will see what I mean. I also would like to give special mention to James Parker Randolph who created the artwork for this album, it truly is an amazing piece of work. I wouldn’t waste anytime in heading over to their bandcamp site where you can stream the music and sit back, relax and enjoy this great release. Digital Antique summons a sophisticated palate marrying a melodramatic classical approach with progressive pacing. However, simply comparing it to prog rock or dubbing it rock opera would be a tad limiting. Those boundaries are broken through by and really, theres no other way of putting this their strangeness. Odd? Yes. Fascinating? Absolutely. Which is why theyre worth checking out. The band got its start in 2008 when its core members met at South Plains College, where they each studied music. Guitarist Travis Kennedy, drummer Payton Holekamp, and bassist James Parker Randolph have extensive musical backgrounds, experience, and a lot of inspiration from varied musical genres. Each has an obsessive ear for detail, which can be deadly, but in the best way possible. Theirs is a collaboration of precise strategies and unconventional melodies, logical processions with illogical signatures. 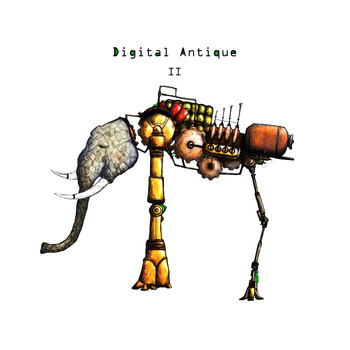 Digital Antique has been described as an instrumental indie rock band with cinematically driven compositions. All true, but their music is also an immensely striking waltz with darkness, winding its way round a complex tapestry of textures and startling aural landscapes. There is something distinctly eerie that threads it all together. This entry was posted on August 23, 2012, 8:03 pm and is filed under Playlists. You can follow any responses to this entry through RSS 2.0. You can leave a response, or trackback from your own site.